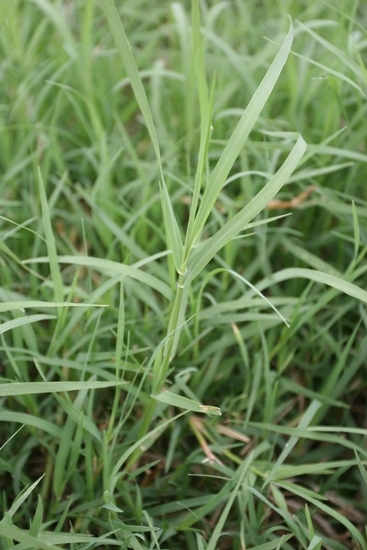 A perennial grass that has both rhizomes and stolons and is capable of forming a turf or mat of fine leaves. 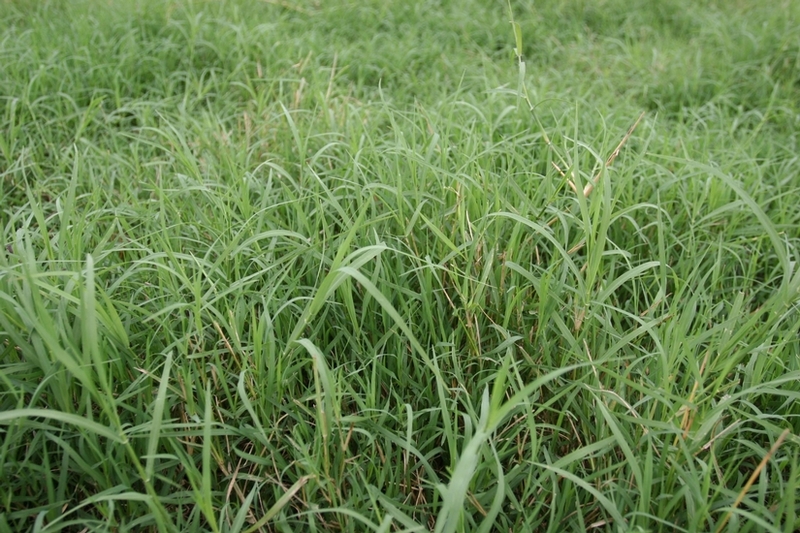 Several varieties of bermudagrass are cultivated for use as lawn and pasture grasses, however this weed has developed into a very troublesome and hard-to-control weed in agronomic crops, landscapes, nurseries, and turfgrass. Bermudagrass is found throughout the southern United States, as far north as southern New Jersey. Leaves are rolled in the bud, leaf blades are smooth on both surfaces, and the ligule is a row of hairs approximately 1/2 mm long. 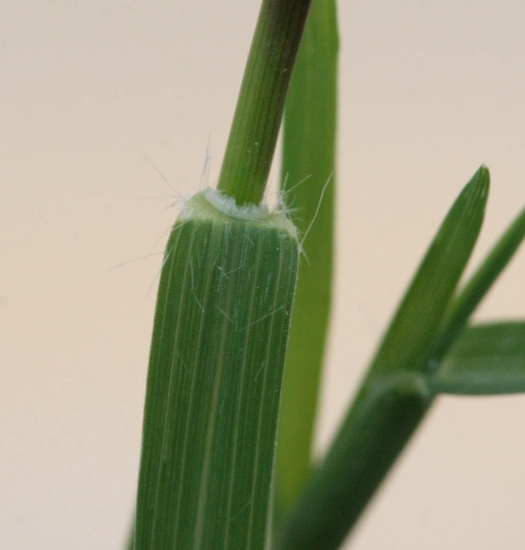 Leaves are rolled in the bud, without auricles, and have a ligule that is a fringe of hairs approximately 1/2 mm long. Hairs occur at least on the leaf margins in the collar region (the region where the leaf blades join to the sheath). Leaf blades are approximately 2 to 7 inches long by 2 to 5 mm wide and smooth to only sparsely hairy above but usually only with a few hairs near the leaf base. 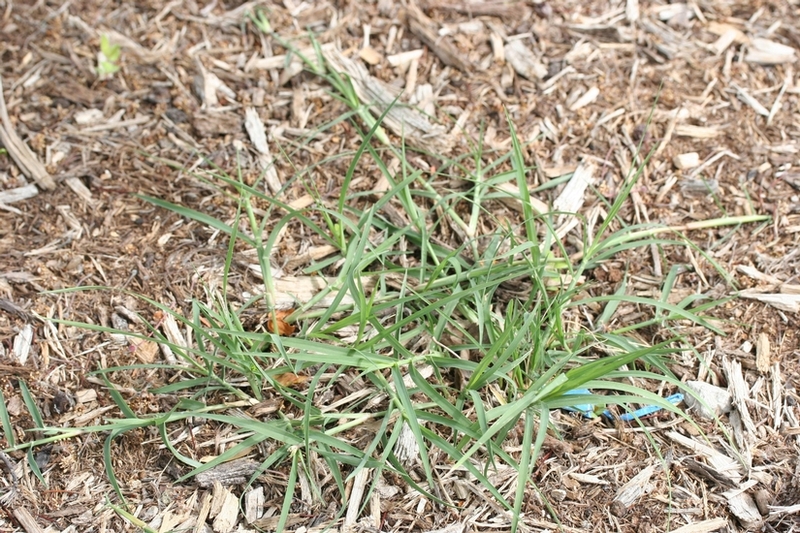 Leaves emerge from opposite sides of the stem and have margins that are slightly rough. Leaf sheaths are usually distinctly flattened with relatively long hairs (1 to 3 mm) near the collar only. 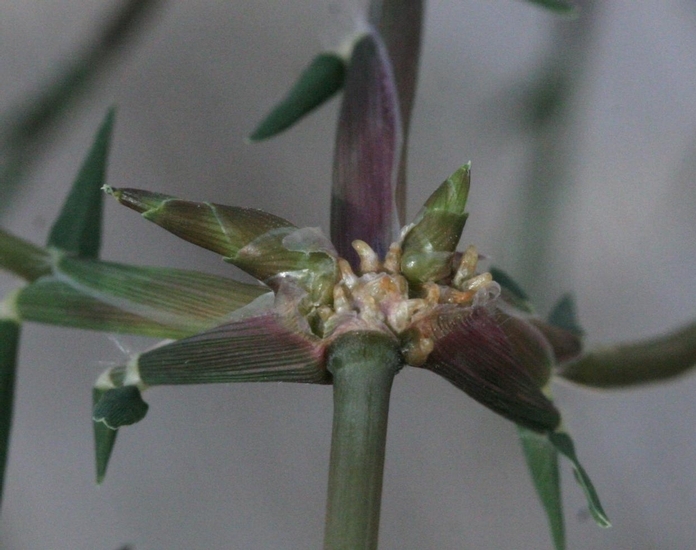 Inflorescence consists of 3 to 7 fingerlike spikes that originate from a single point. Individual spikes are approximately 1 to 3 inches long and flattened. Spikelets are arranged in 2 rows on each spike and each of these spikelets produces a single lance-shaped seed (1 1/2 mm long). 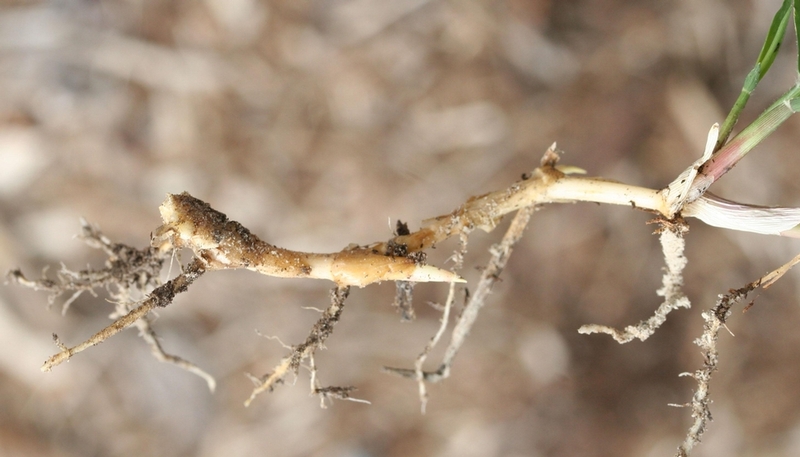 Rhizomes and stolons both occur on the same plant. Rhizomes are scaly and often form an almost impenetrable mat. Stolons are flat, smooth, usually bent and root at the nodes. 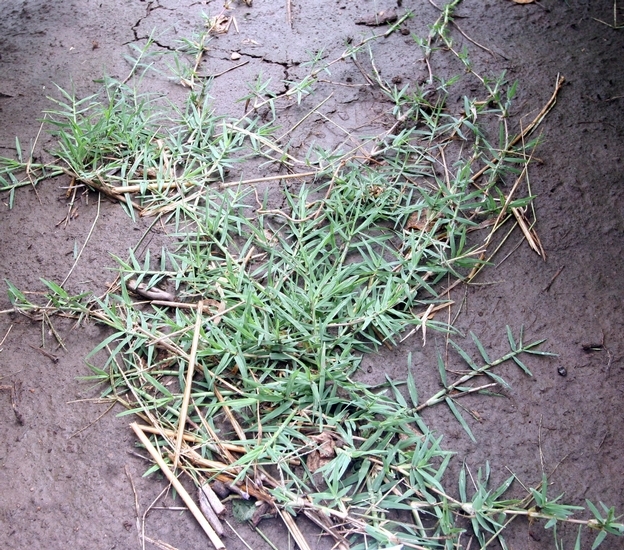 A persistent grass weed with both scaly rhizomes and stolons that root at the nodes. 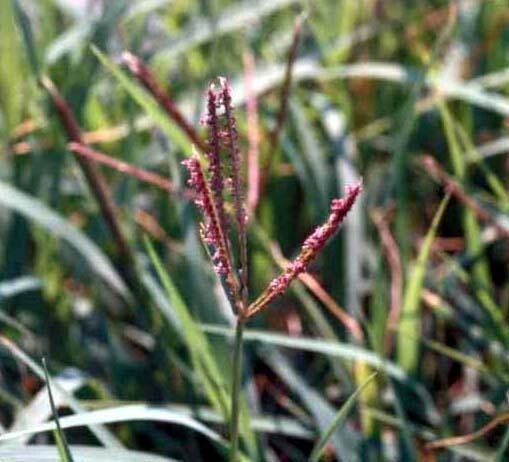 Additionally, the tuft of hairs in the collar region helps to distinguish this weed from most other grasses. Nimblewill (Muhlenbergia schreberi) is similar in appearance and growth habit, however nimblewill plants are generally smaller than those of bermudagrass and have a membranous ligule unlike the ligule that is a fringe of hairs on bermudagrass.